We are living on land where people flourished for tens of thousands of years before European settlement. While there is still a strong local Aboriginal community, sometimes it may seem that there are no physical reminders of how life was prior to European settlement, with the country dug up, built upon, taken over. However, there are many reminders around and these are worth exploring, acknowledging the history of the traditional custodians and their continuing connection to country – one way of bringing to life a phrase often used when we acknowledge country. In September 2015, some friends and I walked to the Birrigai Rock Shelter in Tidbinbilla. A 1984 excavation of the floor area of the shelter found pieces of stone, bone, shell and charcoal dated to 21,000 years ago, at the end of the last ice age. 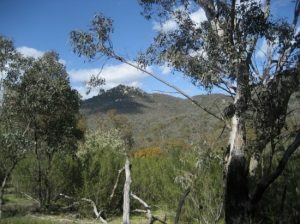 The name Tidbinbilla is derived from the Ngunnawal word ‘Jedbinbilla’ – a place where boys were made men. Birrigai takes its name from the Ngunnawal word for ‘laughter/to laugh’. 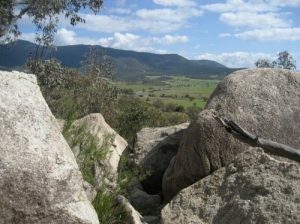 The walk to the rock shelter – signed as the Birrigai Time Trail – starts at the Tidbinbilla Visitors Centre. The first part of the walk is along an open grassy area, past sites used by the farming community that more recently occupied this area. 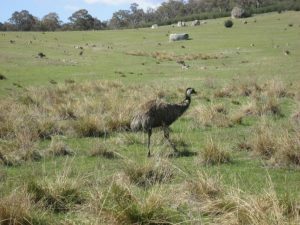 Hundreds of kangaroos and a few emus watched us go by. The walk then goes along a ridge lined by an outcrop of rocks. Here there are lovely views to the valley below. A lizard was enjoying the sun on one of the larger rocks. 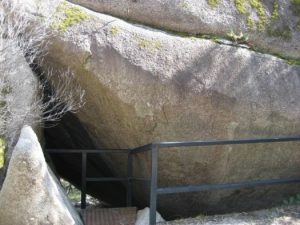 Walking through the many boulders, we came to the main shelter (below left), which is now protected with a platform for viewing. It is in this cave that Aboriginal people camped 21,000 years ago, sheltered from the wind, warm beside fires. We were there on a sunny day, but it was still easy to see how this area would have provided comfort in the high country. It was a very beautiful place. Below right, from further down the track looking back to the main shelter. The walk to Birrigai Rock Shelter is an easy one hour loop walk from the car park. However, just past the shelter is a junction and we took the longer route back, heading up to Gibraltar Peak (seen here) for a more demanding three hour walk. 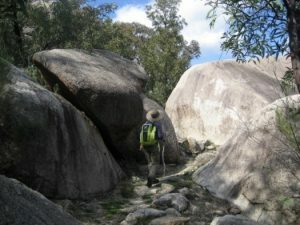 There are other shelters in the Canberra region, including Hanging Rock in Tidbinbilla (a shorter walk, an easy 25 minutes) and Yankee Hat in Namadgi, where a longer walk (around 2.5 hours) rewards with striking rock paintings (www.tccs.act.gov.au/__data/assets/pdf_file/0009/529416/Yankee-Hat-Rock-Art-Site-brochure.pdf). Scarred trees, showing scars where Aboriginal people removed bark for making canoes, shields or carrying dishes (Crace scarred tree: canberratracks.act.gov.au/heritage-trails/track-5-gungahlin/crace-scarred-tree; also trees in Wanniassa, Lanyon homestead and elsewhere). There are also known camping sites, corroboree sites, ceremonial stone arrangements and stone quarries. 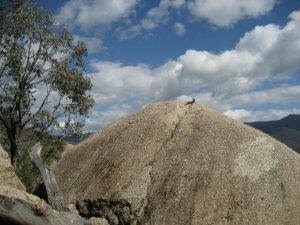 While there is no comprehensive list of sites in ACT, the links here have information on the many reminders of where and how Aboriginal people lived, and also of the value these sites continue to provide to the traditional custodians. 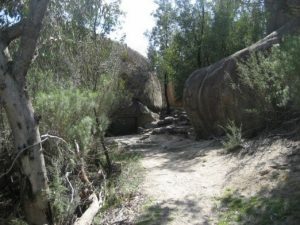 You can hear the stories directly by taking one of the occasional tours run by the Ngunnawal Rangers (www.tidbinbilla.act.gov.au/experience/tours/ranger-guided-activities) or Thunderstone (Murungul Gurubung; http://www.thunderstone.net.au/).